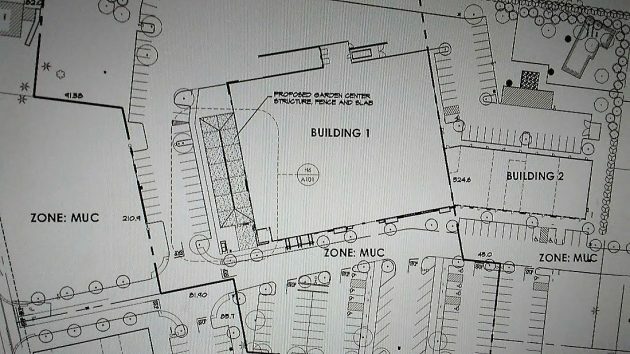 The drawing shows the footprint of the proposed garden center on the west side of the market and hardware store planned for the North Albany Village shopping center. “Can you do a status update on the North Albany store please?” reader Robin Nygren asked a couple of days ago. Yes, I can, because a site plan for part of the project has been filed for the city’s review. Architect Terry Novak filed the site plan on Nov. 7, a day after I last inquired at City Hall and was told nothing had yet come in. The plan is for a greenhouse housing a garden center of about 5,500 square feet in the open area on the west side of the former Ray’s building where The Myers Group of Washington state plans to open a supermarket and Ace hardware store. Site plans can be approved by the planning staff without a hearing. But it will be a while before anything happens. City planners say the application still needs “a couple of minor things” from the architect. When they’re in hand and the filing fee is paid, the application will be routed for review by affected departments or agencies. After that, property owners within 300 feet will be notified, which starts a 14-day public comment period. “Staff-level decisions regarding site plan review take about six weeks once the application is deemed complete,” Lead Current Planner David Martineau says in an email. The drawing shows the outline of the proposed garden center on the west side of the market and hardware store planned for the North Albany Village shopping center. The proposed greenhouse is shown attached to the store building’s left. Charging ahead like a herd of turtles! Thanks for the update. Perhaps by this next summer the project will finally be completed. I’m sure the good people at Tom’s Garden Center up the street on Hickory are surprised to learn now of the new garden supply to be attached to the new store. Keep us posted please on new developments with this continuing saga.